Visitors were invited to sit and listen to music on head phones. Window, doors and doorways. 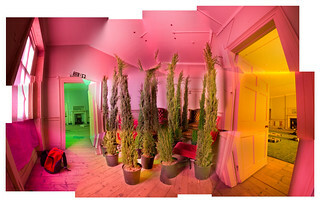 Orange, pink and green illuminated rooms. Potted fir / conifer trees. Buttoned, padded, traditional red leather wingback armchairs. Red, tall, high backed, upholstered, swivel chairs. Wooden floorboards. A 12 image 180° composite panorama. An automatically stitched montage of images, photomerged using Photoshop CS2. Severe perspective differences between individual images created resulted in a wonky German Expressionist, Robert Wiene "The Cabinet of Dr. Caligari" look. White background. See also the related "Brian Eno 77 Million Paintings" set, - an exhibition that ran concurrently at Fabrica Gallery during the festival. This image is part of a set of photos of the Brian Eno Speaker Flowers Sound Installation at Marlborough House (and also of the house itself) on the Old Steine, Brighton, East sussex, UK. The exhibition was presented by Fabrica Art Gallery, as part of the Brighton Festival, May 2010. The installation includes the poems and words of Rick Holland. The Grade I listed house was built circa 1765 , purchased at one time by the Duke of Marlborough, and substantially remodelled by the Scottish architect Robert Adam. Arena TV series theme tune video by Brian Eno. Microsoft Windows Start-Up Sounds collection video (Including Windows 95 music by Brian Eno). Some of the photos in this set are presented in multiple versions made possible using HDR (High Dynamic Range) photography - these variations are displayed with more than one exposure, gamma, "local adaptation" compression or "unsharp mask" process. Many rooms had their windows screened using coloured Crêpe paper / tissue paper. This gave their illumination a colour cast - which has been exaggerated (or neutralised) on an image by image basis. The actual experience of the coloured light was one of only a slight and soft hue. In some instances the photos have modified to give an architectural, classical, "two-point" perspective - with forced, parallel verticals.